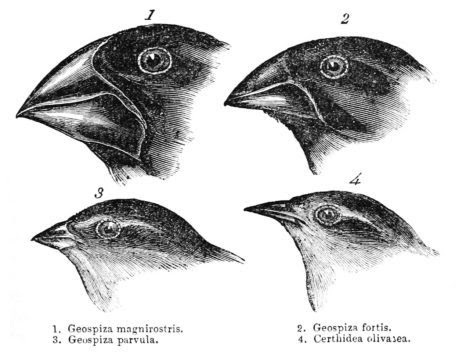 For over a century, textbooks have used the Galapagos Island finches as an example of evolution in action. The facts are that the differences between these finches are less than the differences in the human population – and nobody claims that we are evolving! A lesser-known example of evolution in action was recently challenged in the scientific literature concerning certain hummingbirds found on the island of St. Lucia in the Caribbean. For a long time it was claimed that one species of hummingbird was diverging and becoming another species. However, it now turns out that the birds were nothing more than the male and the female of the same species! The male of the species has a relatively straight bill perfectly designed to allow efficient feeding of the nectar from the red and orange blooms of a flower related to the bird of paradise. The female bird, on the other hand, has a longer, sharply curved bill that is perfect for feeding on the green flowers of a different plant, also related to the bird of paradise. Those who believe in evolution point to such differences and argue that it is the environment that has caused these differences to develop. The creationist would certainly agree but point out that those variations are strictly limited. Giving one of these variations another species name does not make it a different species and, thus, cannot be used as evidence for evolution in action. Again, to use the human example, humans come in different colors but no one now applies different names or claims that we are evolving. Prayer: Lord, help me understand how Your hand is revealed in Your creation. Amen. This entry was posted in Birds, Birdwatching, Christian and tagged Bird Beaks, Christianity, Creation, Creation Moments, Creation vs Evolution, Galapagos Island, Home School, Kids, Nature, Youth. Bookmark the permalink.